Thanks for the recommendations, Mark has the dust-jackets that I want, so I will get them from him. 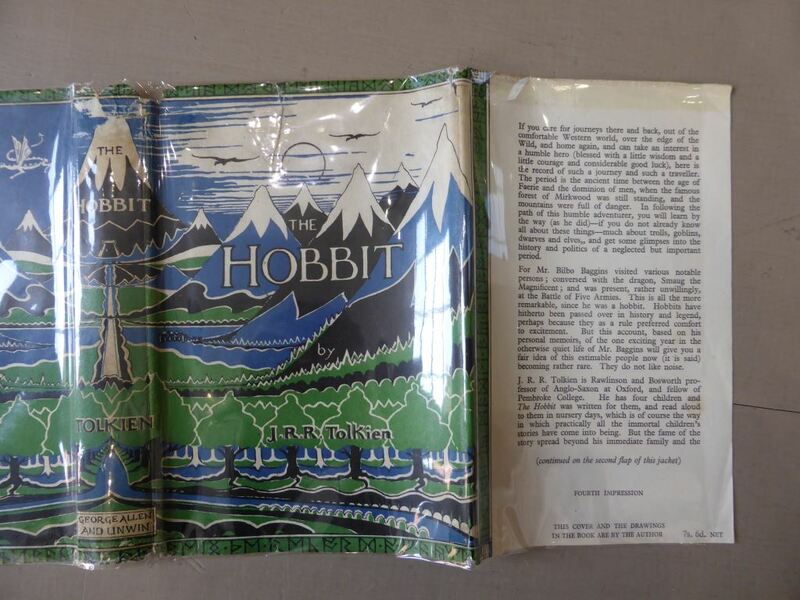 I'm trying to mock up a facsimile DJ for a 4th Impression Hobbit (using various sources) to put on a "beater" ex-libris copy that I picked up for a few bucks. My choice is to get Mark at Facsimile Dust Jackets to resize a 1st imp jacket (which seems like overkill for a tatty old copy) or to have a go at making one myself using elements from other impressions, which has a bit of a fun aspect to it. I've found a few photos on the internet that tell me most of what I need. However, can anyone help me with the text that is inside the back flap? I only have a photo that is partially obscured, so I can't make out the text. The front flap isn't a problem - I've figured out the text for that from a similarly obscured picture coupled with the full info gleaned from other impressions. If anyone knows the correct font for the text (should it even exist in electronic form), that would also be handy. Times New Roman is actually remarkably close, with the chief difference being the "M"s, which do not have slanted sides. Ta in advance for any help. Edit: I figure that it will end up something like this (this is just a low res version for getting the layout right to fit in the book and look vaguely authentic). The exact sizing and spacing of the text will take a bit of mucking about, but it doesn't need to perfect - not like I'm trying to pass it off as real. These are scans of my 4th impression dust-wrapper. 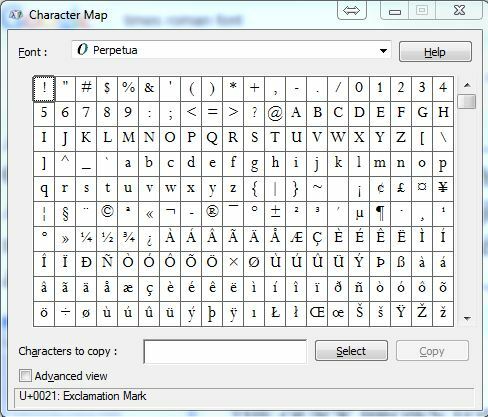 On my Windows computer, I have a font called Perpetua, this seems to be a better than Times New Roman. Thanks, Trotter, that is very helpful. I'm currently trying to take a high-res scan of a 1980s A&U DJ (plucked from my shelf) and modify it back into being a reasonable representation of a 1st Ed wrapper. I figure it forces me to improve my graphic skills (which are limited). I'm just moving the main title around and resizing bits and bobs at the moment. 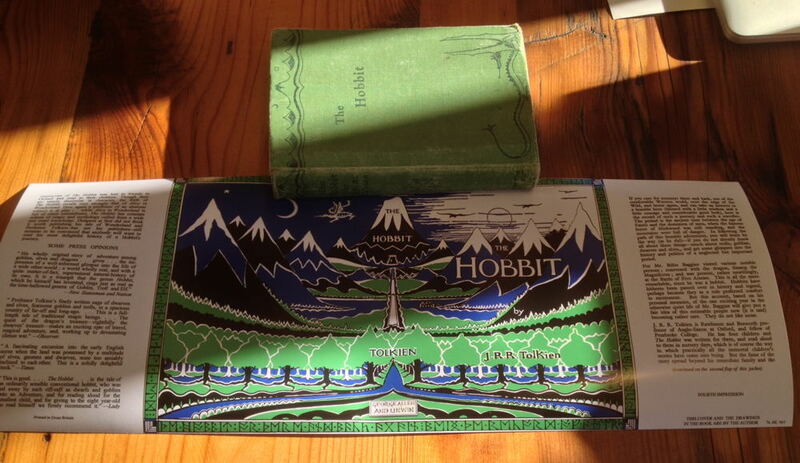 I have a lowish res scan of a 1st which I have in a layer underneath to help me get things in the right place and I have "The Art of the Hobbit" to hand as well to snag a couple of bits and bobs from. Amazing how essentially the same picture changed over the years. 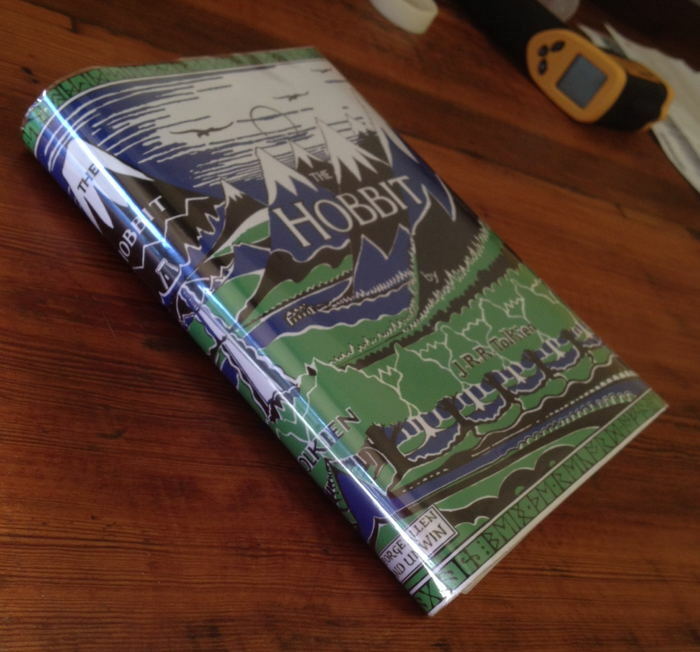 (you are probably wondering why I don't just scan an old wrapper, and the answer is simple - I don't have any early Hobbits! My first Hardback copy came to me new in 1985 and I never purchased any earlier ones (a bit of a mistake with the benefit of hindsight!). Well, here is a quarter size version of my efforts. I started with my 1985 4th Edition Dust Jacket and worked from there using a low-res scan of a 1937 jacket (as a disposable background layer that I could flick into view to see how things were progressing) coupled with Trotter's photos of his 4th Impression as a guide. *Adjusted trees in terms of where white/blue is visible. *Adjusted clouds to right of "THE"
*Removed/Added white bits all of the place. *Moved "H" downward slightly relative to "OBBIT". Increased Size and repositioned. *Added 1946/4th Text - first three paragraphs from a 1st/4th scan (the front flap is tipped into my copy, so I had a source for this). Impression and cover attribution created manually in MS-Word. 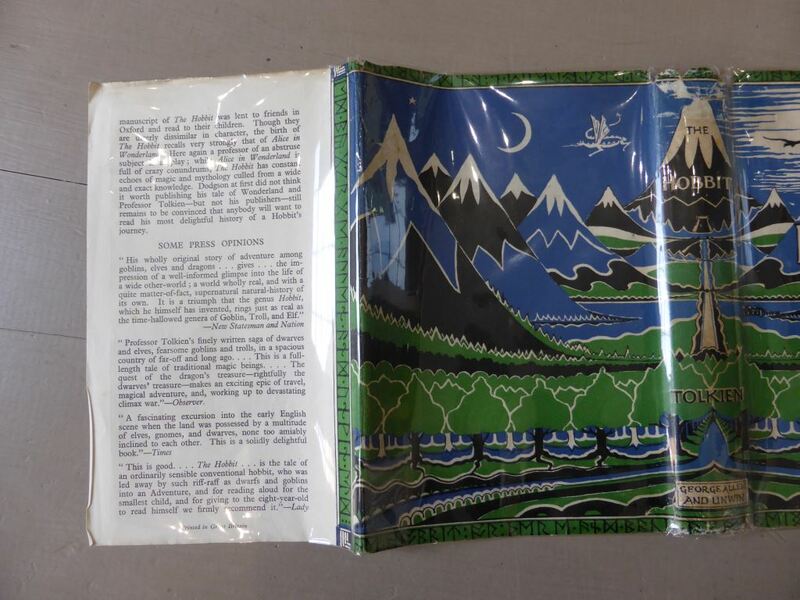 Mark Terry will be recreating both the first and second facsimile Hobbit dust jackets to correct the problem with the runes that have been discovered. It does appear to affect every copy that he has sold to date. 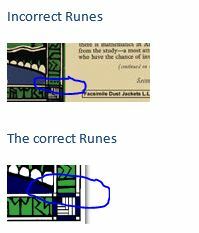 If you have a facsimile dust jacket and want to check them it is easy to do so, by looking at the lower right hand corner at the images below. Probably worth mentioning as well that Mark is not the only supplier of jackets that are incorrect, as it seems that there may have been some re-scanning of the bad facsimiles in order to create new ones. If you are in the market for a jacket from *any supplier of jackets* you need to check the runes in the bottom right and/or directly above and below the spine. These will be completely different from that of a legit UK jacket. There are several other faults on the jackets (such as the sizing of spine text, the cutoff point of the main image, noticeable on the clouds at the top right of the front, the cutoff point of the picture at the bottom), but these are the dead obvious* ones. (* So dead obvious that I initially tried to copy them when creating my jacket! Thanks to Trotter for setting me straight as to what was right/wrong when I brought the differences to his attention).